With Sunderland’s finest now back in business and a new album ‘Heavy Metal Sanctuary’ due for release at the end of February, SPV have set the ball rolling with a long-overdue re-issue of Battleaxe’s 1983 debut album ‘Burn This Town’. 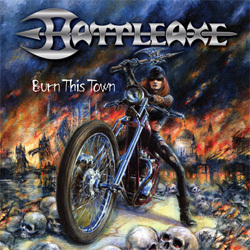 Originally recorded at Guardian Records’ studios but then released by Roadrunner and Music For Nations (in a truly horrendous sleeve) on its release ‘Burn This Town’ proved to be a solid NWOBHM debut. Cuts like ‘Her Mama Told Her’ (despite its terrible title), opener ‘Ready To Deliver’ and the self-referential anthem ‘Battleaxe’ are lean cuts of meaty metal, aggressive and unapologetic, and as representative of the NWOBHM as it comes; the tinny production takes some of the shine off the material, but as the sleeve notes indicate the band saw these as merely demos, but Roadrunner accepted them as they were and the rest, as they say, is history. If ‘Burn This Town’ didn’t exactly set the world (or the town) on fire, it did make people sit up and listen, earning the band both a BBC session and a support slot on Saxon’s February 1984 ‘Crusader’ tour. Unfortunately, after just one more LP Battleaxe ground to a halt; a shame, because for many the band were really hitting their stride, but the music world had by now started to move on to bigger and thrashier things.